So the new Gilman District plaza in West Berkeley, at the intersection of Gilman and 9th streets) is shaping up nicely. First, the new Philz Coffee opened; then, we got a firm date for Whole Foods' impending arrival. The latest newcomer? The new location for the Temescal Alley filled-doughnut specialist Doughnut Dolly, which just announced that its Berkeley shop will open next Wednesday, August 6, bright and early at 7 a.m. Owner Hannah Hoffman told What the Fork that the setup of the new location will be more or less the same as the original shop, at least to start out: She'll offer four rotating flavors — for opening day, it'll be her signature "naughty" cream, strawberry jam, dark chocolate, and bourbon cream. As an opening day promotion, the store will also give away free coffee with any doughnut order. 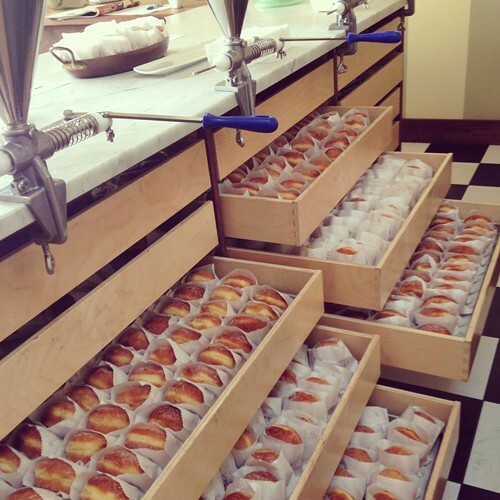 Drawers full of doughnuts (via Facebook). Eventually, Hoffman plans to add additional menu items, but she's keeping those details secret for now. Stay tuned, doughnut fiends.